The VWR 6000 Recirculating Chiller provides compact and reliable, digital chilling that acts as an economical alternative to tap water cooling. This microprocessor-controlled circulator allows users to digitally set their desired temperature, temperature display, as well as pressure/ flow rate all with the touch of a button and a turn of the dial. This 1.1-gal chiller has a temperature range of between -10 to 40°C / -4 to 104°F and features a ¼ horsepower compressor. The VWR 6000 benchtop chiller has a flow rate of up to 15.5 lpm/ 4.1 gpm, and a maximum pressure of 10 psi, powered by a magnetic drive centrifugal pump. This recirculating chiller helps to cut down on water consumption while providing reliable cooling for applications such as laser etching, AA furnaces, ICP, rotary evaporators, vacuum systems, reaction vessels, plasma etching, and condenser cooling. Please Note: This unit came to us new in the box. We opened it to test and make sure it had a clean bill of health. We ran the chiller at -6.5°C for two hours and then ran the unit at 35°C for two hours. The Chiller is in perfect working condition with a clean bill of health. 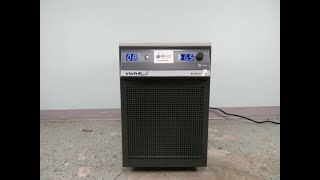 This VWR 6000 Recirculating Chiller (Heating/Cooling) Model 1171MD came to us new in the box. We opened it to test and make sure it had a clean bill of health. We ran the chiller at -6.5°C for two hours and then ran the unit at 35°C for two hours. The Chiller is in perfect working condition with a clean bill of health. All of our lab equipment comes backed with our standard warranty. Should you have any questions please don't hesitate to contact us.